“Year-end visitor arrival statistics for 2018 confirm three straight years of economic comeback and uninterrupted growth for the island’s tourism trade,” according to a report out today from the Bermuda Tourism Authority. “By every imaginable definition, Bermuda’s tourism industry is on a sustained path of recovery,” said Kevin Dallas, Bermuda Tourism Authority’s chief executive. “Our team put together a totally fresh tourism approach in 2014 and 2015. Stakeholders believed in our vision and helped build on the new foundation. That two-step process is the reason the country’s tourism has progressed so impressively. The BTA added, “The employment of Bermudians in the hotel industry, for example, is up 23 percent between 2016 and 2018, according to the government’s most recent quarterly statistics bulletin. “In 2018, total visitor arrivals surged to 770,683, an 11 percent increase over the previous year and a new record for Bermuda. Air leisure arrivals finished up 12 percent year-over-year and spending from this audience jumped 11 percent. The 203,697 vacationers to arrive by air in 2018 is the best performance in this category in 16 years. Back in 2002, 218,248 visitors flew to the island for leisure travel. “The steadily rising number of leisure travellers is driving greater direct spending into the local economy. 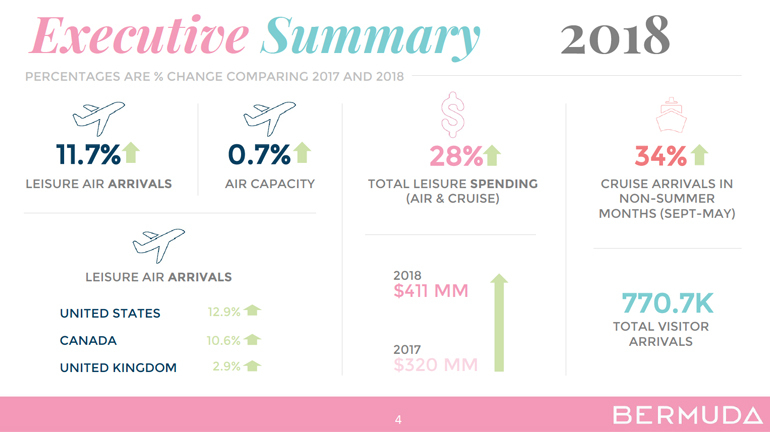 With air visitors up 12 percent and cruise visitors higher by 16 percent in 2018, total leisure visitor spending surged 28 percent year-over-year. “Per person leisure spending fell slightly for air visitors in 2018 – not unexpected in the wake of America’s Cup – but because the amount of these travellers was sharply higher, total spending grew. And government wants to stick their grubby fingers into this prosperous pot. Yes the Government has stuck their fingers in it by charging 4.5%. They didn’t think it would effect the arrivals. It has. For 2018 I had 8 weeks signed and sealed before Jan 1st, this year 2019 I have only had 1 by Jan 1st. Maybe they killed the golden goose. Something is going wrong. It’s great to hear from someone who has skin in the game. To be fair, BTA & Airbnb were behind the 4.5% the government just followed along. He is right lot of work still. We had nowhere to go but up..
and we are far off mark of 2002 number and highs before that. Their product is inconsistent uninspiring and shoddy compared to peers, maybe Reefs, TP rooms, Loren rooms ok but is there really value for money compared to peers? St Regis if it ever happen wont cut it. If you were a brand and you did your due diligence and studied up on the BIU and immigration would you be coming to Bermuda? What’s happening with Morgans Point? What’s happening with gaming? With a 23 percent increase in Bermudian employment in the hotel industry, I would hope leave the model that is working alone!!! Thank goodness for tourism. Is the Minister still going to look under the hood and tear the car apart? OBA – 4-20 years. De-politicize tourism, let the professionals run it. Take grubby little politicians out of the decision making process. And here we are….three short years of steady, upward progress. Good news for Bermuda and well done the BTA. I’m sure! the great coverage of the America’s Cup played a role in this. Good thing PLP is getting involved. This is out of control! That you BTA and America’s Cup knock on effect! so while we wait … and wait ….. for anything fintech related to create jobs, here we see a policy implemented by the OBA that is creating and sustaining jobs. Where is the PLP’s economic plan? Where is the next economic stimulus coming from? When will retail sales pick up? when will GDP show a real rise? when will taxes come down? when will health costs come down? Give it time, the PLP needs something positive on thee resume. You do not present a resume with the word maybe…. Let’s hope Zane keeps his grubby incompetent hands off it. He should stick to returfing contracts. More lucrative. No! This cannot be allowed! Quick, Minister, disband this group of BTA people immediately!